The problem with being a food blogger is that you can’t blog about a special Mother’s Day treat without your mom finding out. My mom has always been my most loyal reader; no doubt she will see this post and my surprise will be ruined. But what can I do? I can’t keep an idea like this to myself. It’s too good not to share. Remember in elementary school when you used to make those messy, colorful Mother’s Day cards with glue and glitter and macaroni? Remember how your mom’s eyes lit up when you gave her those tissue paper flowers with pipe cleaner stems? Moms always appreciate it when you make them something from the heart. What mother wouldn’t love to receive a gorgeous box of homemade chocolate dipped strawberries for Mother’s Day? The grocery stores and farmer’s markets are teeming with luscious red berries this month; you can even buy the extra large long stemmed berries for a few dollars more. 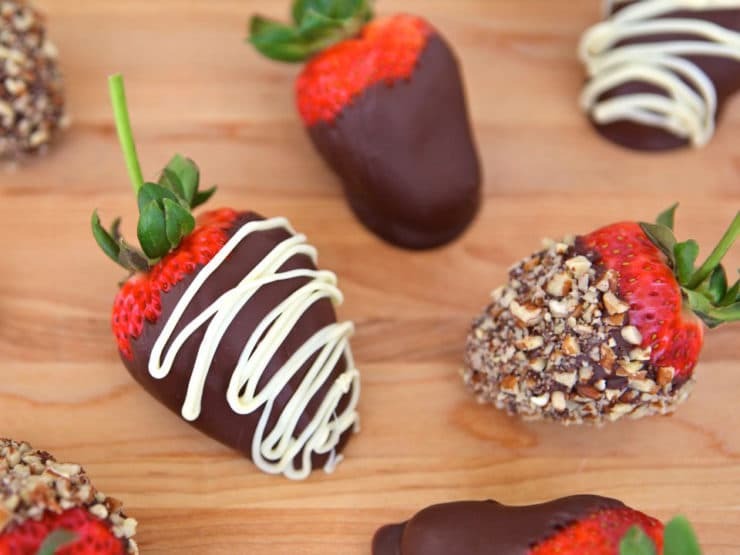 In some stores, a dozen chocolate dipped strawberries will cost you up to $50. No need to spend the money when you can make them at home for a quarter of the price! I’ve given three options for decorating your strawberries below– plain chocolate, drizzled with white chocolate, and dipped in nuts– but who says you need to stop there? You can dip them in candy sprinkles, chocolate chips or chocolate cookie crumbles. For foodie moms, sprinkle dark chocolate strawberries with a few flakes of sea salt for a sweet and salty effect. Use a higher quality chocolate for the best flavor. 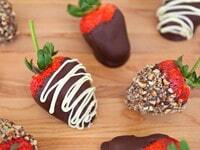 To make dairy free, pareve, vegan strawberries, use dairy free chocolate for dipping. There are many delicious possibilities! Learn to make beautiful chocolate dipped strawberries in this easy tutorial. Makes a beautiful and delicious homemade gift. Dairy or Pareve. Rinse the berries well and pat dry (make sure they're completely dry with no drops of water present). 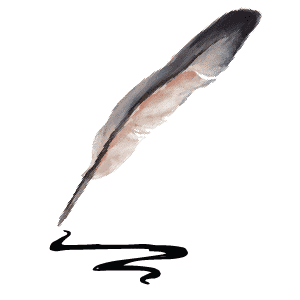 Line a baking sheet with parchment or wax paper, or nonstick foil. Melt your chocolate. If you are using both dark and white chocolate, you will need to melt the two separately. The chocolate melts best with indirect heat-- I use a double boiler pan. 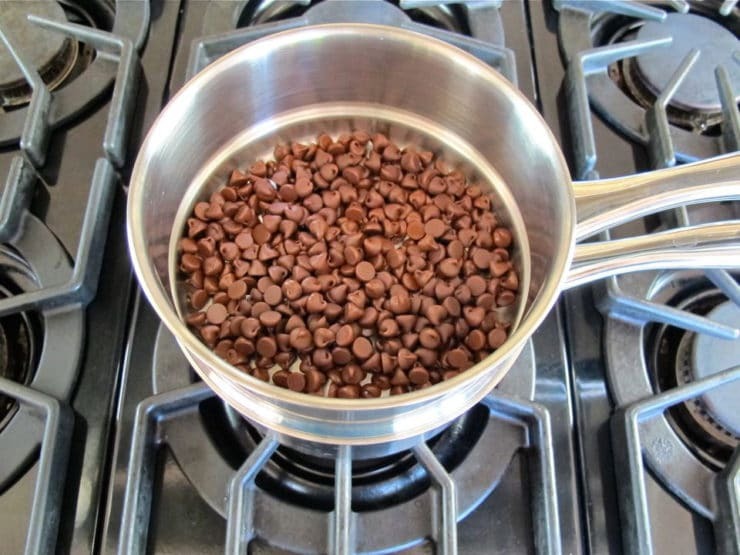 If you don't have a double boiler, simmer 2 inches of water in a saucepan, then place a heat-safe bowl in the water and melt the chocolate in the bowl. Alternatively, you can microwave the chocolate on 50% power power for 2 minutes (or until melted), stirring once halfway through cooking. At the end of cooking, stir-- if the chocolate is not melted smooth, continue to microwave in 15 second increments till fully melted. Once your chocolate is melted, you're ready to decorate. Assemble your parchment lined baking sheet, melted chocolate, and chopped nuts, if using. 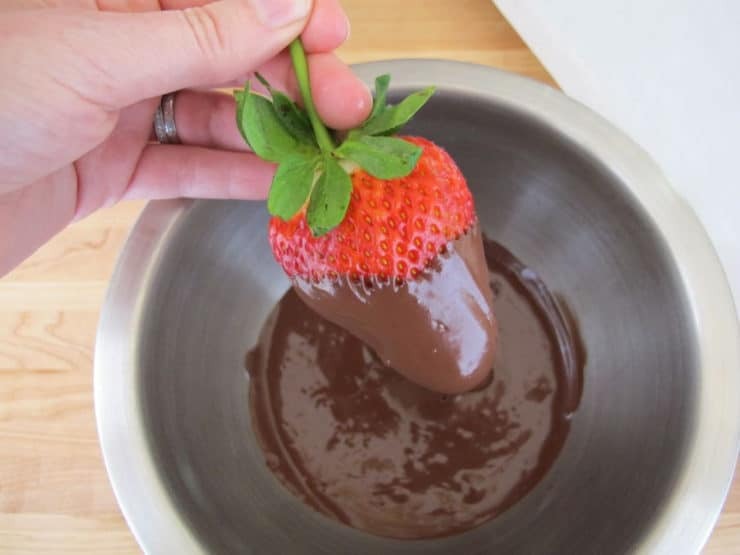 Dip the strawberries one by one into the melted chocolate, coating them 1/2 to 3/4 of the way up. Lift and twist the strawberry as you pull it out of the chocolate, letting the excess drip back into the bowl. 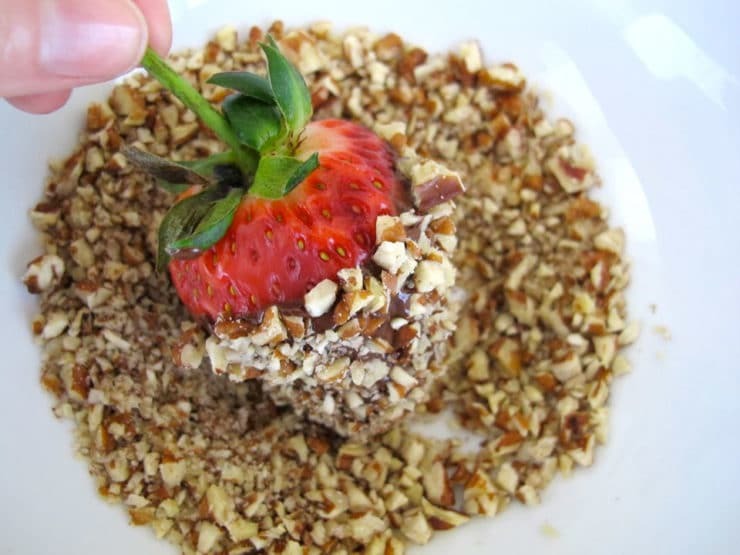 If you don't plan to dip the strawberries in chopped nuts, place the dipped strawberries onto the parchment. Do not move or touch them once you've set them down, or you will disturb the lovely chocolate shell. 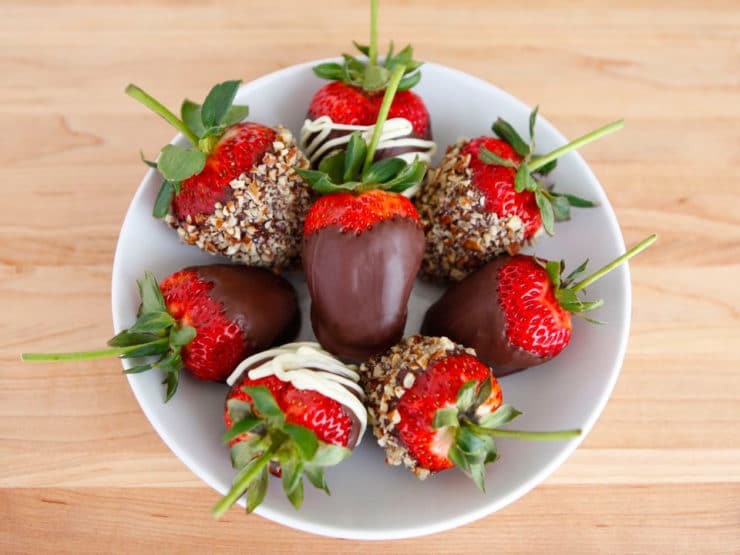 If you plan to dip the strawberries in chopped nuts, roll the chocolate dipped strawberries gently in the nuts to coat before placing them on the parchment. 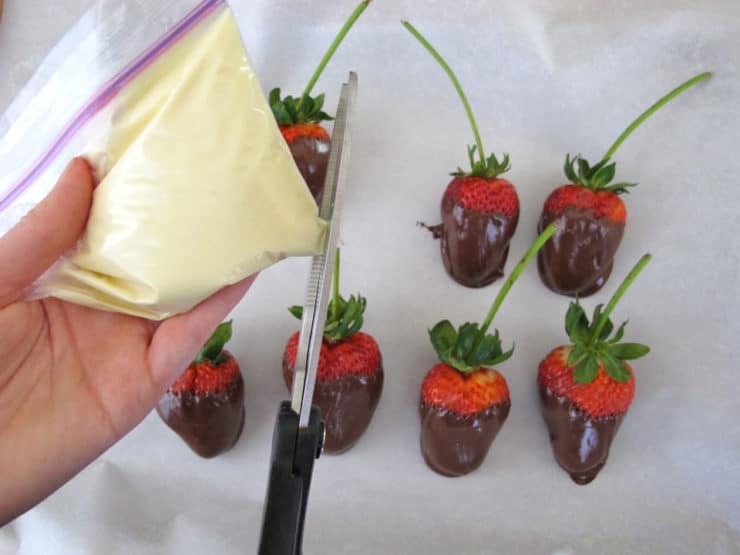 After dipping the strawberries in chocolate, if you want to drizzle them with white chocolate, pour the melted white chocolate into the corner of a plastic zipper bag and seal. Cut a very small tip off the corner of the bag. Gently squeeze the white chocolate through the hole in the corner, drizzling the chocolate in a thin stream on top of the chocolate dipped berries, moving your hand to create artistic squiggles. 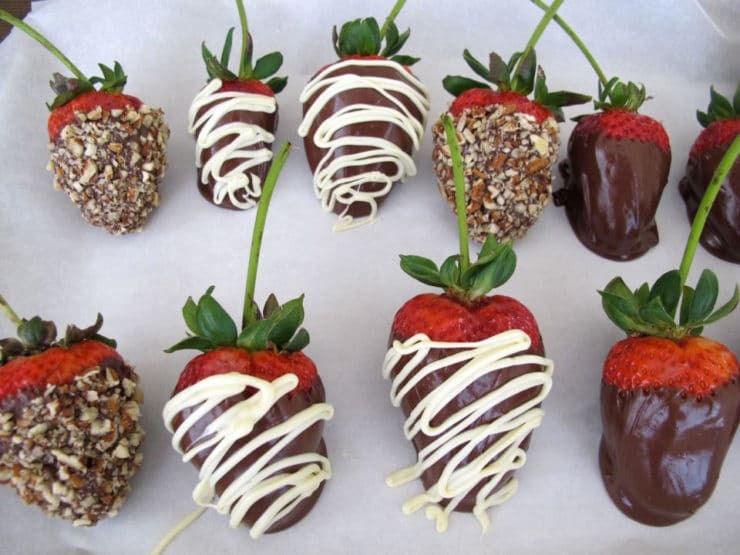 Once your strawberries are decorated, place them in the refrigerator for about 30 minutes till the chocolate sets. You can serve the chocolate strawberries chilled or at room temperature. Chilled strawberries will have a nice crunch to the chocolate-- room temp will make the chocolate a bit softer to bite through. Place them in a pretty tissue-lined box for gift giving, if desired. Hi Jackie, Tori’s assistant Ashley here. You aren’t doing anything wrong. 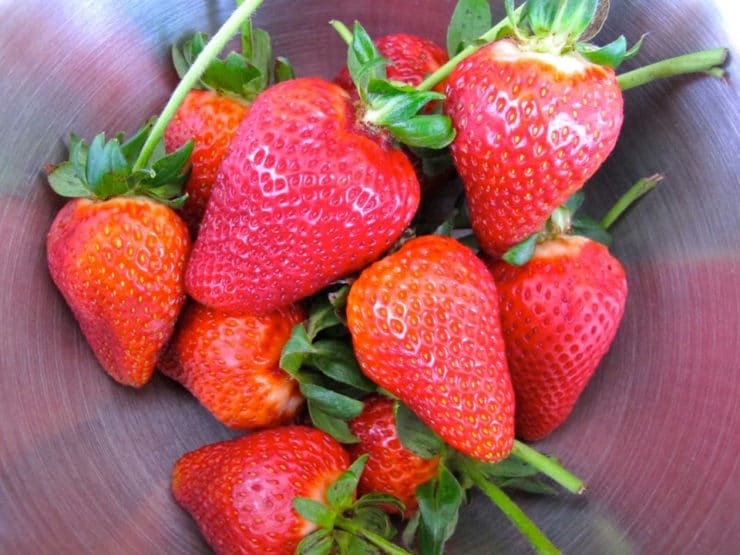 🙂 This specific method creates a hard shell around the strawberry rather than sealing to the strawberry itself, sort of like a chocolate case for your fruit. What is considered high quality chocolate? Hi Aishe, Tori’s assistant Ashley here. High quality chocolate usually contains only a few ingredients and few (or no) additives. Great recipe. Just finished making 150 chic covered with white chic swirls. 100 will be used to write “100” on display for my mother in law turning 100 tomorrow. All will be eaten for sure but wanted to use fruit to show the significant number. Loved it was very helpful and easy to understand the steps thankyou. 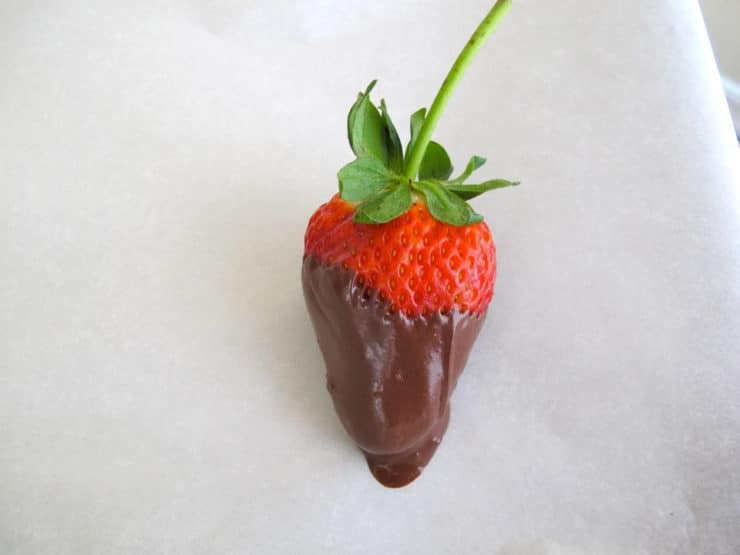 Delicious recipe – when we make chocolate covered strawberries, I put them first in the fridge for 30 minutes – this way, melted chocolate solidifies faster. Thanks Tori, making these at kids cooking school today. Thanks Tori, I know that about water. I was just so frustrated. I know white chocolate presents different issues than other chocolates. I just did them with semi-sweet chocolate and no issues at all. They are perfect! My friend prefers white, and I was making them for her birthday. I’ve been frustrated with white chocolate on a number of occasions, it’s just more finicky for some reason. Glad you were able to make a pretty batch! I need to make these with WHITE chocolate. Have choc melting in dbl boiler. Keeping it on heat. Berries are very dry. Chocolate just keeps globbing and sliding off. I want thin smooth chocolate. Tried adding a bit of water to smooth and thin the chocolate, same results. Beth, water should never be added to melted chocolate, it causes it to seize. I’ve found white chocolate much harder to work with than dark or milk, it doesn’t melt as smoothly. You might have better luck melting it in the microwave… just make sure to keep water very separate from the whole process. How long does it take for the strawberries to dry before dipping? Hi Linda– do you mean, dry from rinsing? You can pat them dry with paper towels to get them completely dry, no need to wait. If you mean how long does it take for the chocolate to dry before dipping in the nuts, you shouldn’t wait– they should be rolled in the nuts while the chocolate is still wet. I hope that answers your question? I’m making some for a baby shower for twin boy and girl, dipped in pink and blue melted Wilson’s brand candies. Thanks, Tori. I know I’m being specific about the timing for making the dipped berries, but as I read people’s questions and comments, it’s clear many people just don’t grasp how perishable this type of treat is. That’s why retailers can charge so much for them! 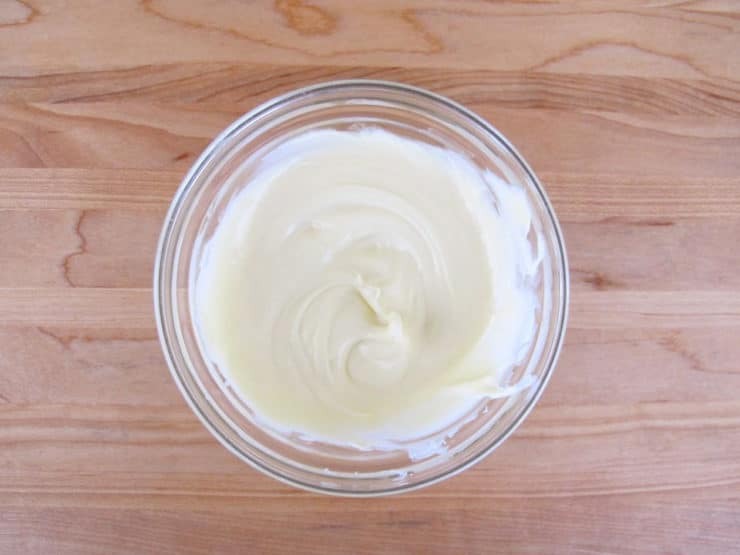 As you said, if you want a treat you can make at least a day ahead, dip food that doesn’t spoil quickly. Dried fruits, pretzels, marshmallows, potato chips, cookies, fresh orange sections (or canned mandarins) and grapes will all work. I’m going to make some with hershy chocolate, hopefully they come out right! Anne92 Hershey’s chocolate syrup won’t work, you need to use melted chocolate as described in the recipe in order for it to harden into a shell around the fruit. 1.) You can always beg (or buy) a box at a local bakery or candy shop, if you don’t have time to shop for one. Additional resources for really cute containers (and inexpensive plain aluminum containers with clear lids) are places like Amazing Savings, Christmas Tree Shoppes, and even Target (in the $1-$3 bins in front). You can also order supplies online from many places. my kids actually took over dipping them, by the time they were 9 or 10! As long as the washed berries are bone dry, it’s easy. Lisa, great tips, and I totally agree– the fresher the berries are dipped, the better for the look of the berries… though they’ll taste the same the following day if they are refrigerated the whole time, they won’t look quite as nice. Going to make some for valentine’s day. How many days in advance can I make them and how do you store them and for how long and what type of box to put them in for gifts? Thanks so much for all the kind help. Glenda for the freshest look I wouldn’t make them more than 1 day ahead. Store them in the refrigerator to keep them fresh. As for the box, I suppose you could use any candy-sized box… best to visit a local crafting store, they should be able to help you find something suitable. Enjoy! I been wanting to have some chocolate strawberries for a while! I almost ordered my sister chocolate covered fruit/treats for her bday but decided to go with homeade which I always appreciate more. I have to mail them and it may take a couple days to get there… any suggestions or ideas to keep themlooking and tasting good.? Hi Ashley, in order for your treats to stay looking pretty and fresh I would suggest using dried fruit instead of fresh. I don’t think that fresh fruit would keep for very long without refrigeration. There is always a chance that your chocolates appearance will change if the package travels through various changes in temperature, so keep this in mind. I would package the treats between sheets of wax or parchment paper in an airtight container, such as tupperware if you have some to spare. I was thinking of serving strawberries as fruit at my daughter’s wedding in April 2014. It is a wedding weekend in the bush as she calls it so there are several meals to be made up and served between Fri – Sun. She is having finger food for her reception and now I have read your strawberry recipes I am convinced to do the many varieties. I am also doing the same with prunes. In this day and age you don’t need to serve the usual cakes and pastries for sweets. Thank you for the ideas. I am going to wander through your blog to find some other recipes I can make that a week (freeze) or a couple of days ahead so I am not running ragged cooking on this special weekend. Love the idea of chocolate coated and nuts.I also did coloured sprinkles and sugar pearl on some with white chocolate.Thanks for the recipe amazing. I’m going to do this for mother’s day! I love you mom! I agree wholeheartedly! I make them at the drop of a hat, especially when my grandchildren, chocolate lovers all, come to visit. We also dip pineapple, bananas, oranges! Had to send mine early. And it was a bit spending since it is coming out of Maine. Great idea! Making these for Mom this weekend. Thanks! Oh! Love choc dipped strabs! Hi! This is such a warmfelt idea I love it. For the thing that we use to let the dipped strawberries sit on , can we use foil? I dont have the fancy paper some people use when doing the dipped strawberry. Foil should work just fine Diana. Enjoy! Any brand is fine, though I do love Ghirardelli and higher-quality chocolates. Good luck! how far in advance can these be made before serving at dinner time (want to make them as a passover dessert). If I refrigerate these, will they soften and spoil whole texture? And if we can put them in fridge; should they be covered or left open on the plate? Make them up to one day ahead and refrigerate uncovered. The texture should be fine. Enjoy! I made these today with my 2 kids(5 yr. old daughter and 3 yr. old son) we made over a dozen and they came out so pretty. We made an arrangement for my husband in under $10. Thanks for the simple instructions. So happy to hear that Rosio. It’s definitely a fun project for the kids! I really can’t see why anyone would pay those exorbitant prices for the store bought ones, especially at the gourmet shops, when it is so easy and fun to make them at home. I made 3 dozen for about $9.00. Jody– agreed! The markup is insane, and when you make them at home you know exactly what went into it! Thank you so much Tori I just made them for my mom for Valentine’s Day. Btw I’m 11 and I can read your simple instructions, Thanks!!!! That is awesome Little Ms. Sunshine! Very impressed with you, rocking the kitchen at 11 years old. Your mom is going to be so happy. You go girl! I’m making them with multicolored sprinkles on them. Valentines day is right around the corner and I’m going to try to make the tonight. They look yummy!!! As you always have spare chocolate left over, try getting blueberries and/or raspberries and gently stir them around the leftover chocolate to coat them then separate them out on a bit of parchment – I think they’re even better than the strawberries and look great in a bowl, eaten straight out of the fridge like little candies! In the past ive always bought chocolate dipped strawberries as gifts. I think for Valentine’s Day this year I will try these with the kids. They look beautiful! I love the simplicity of your instructions. I love that this is a CHOCOLATE recipe even more! Tori these are so lovely. I would love for my kids to make something like this for me. So gorgeous. Look like the ones you could pay an outrageous amount for from some online or mailorder companies. These are lovely, Tori! So elegant, but so simple! 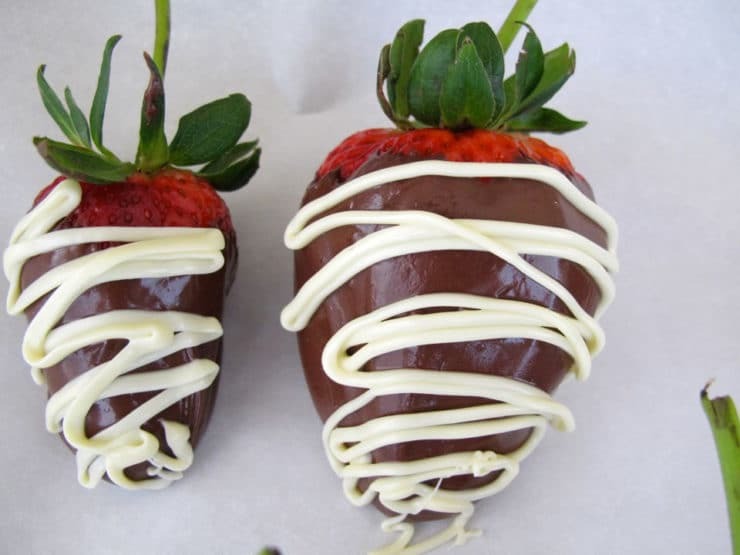 Mmm I LOVE chocolate covered strawberries and these look amazing! And, while we talking about chocolate covered fruit, Trader Joe’s has boxes of (kosher) dark chocolate covered dried (tart) cherries that I am positively addicted to! I’m thinking of cutting them up and baking them into brownies…..
Those make my mouth water! Great tip Lisa, and so true. I did mention to pat them dry, but I will add the word completely to make sure it’s clear. Thanks! One thing though here…please use ORGANIC strawberries. They are one of the most highly sprayed fruits with pesticides! Made them! They came out scrumptious. So happy you liked them Nina! I’m craving those strawberries right now! A treat any mother would love!! Can’t wait to try them! I love this classic deliciousness. So awesome!